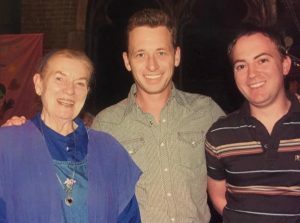 Silas House (middle) with Jean Ritchie, and his partner Jason Howard, editor of the literary magazine Appalachian Heritage. Above all, kindness always lit up the face of Jean Ritchie, who passed away June 1 at the age of 92. And she possessed the same kindness in her hands, in the slight, humble bend of her neck, in her beaming smile. And of course that kindness came through the clearest — the cleanest — in her voice. It was there in her speaking voice, but also in her singing, the very thing that caused The New York Times to proclaim her “a national treasure” and the reason she became widely known as “The Mother of Folk.” But along with that kindness was a fierceness that led her to become one of the major voices in the fight for environmental justice. I grew up in Southeastern Kentucky, two counties away from where Ritchie had been raised. She was a source of incredible pride for my people. Everyone I knew loved Jean Ritchie, and they especially loved the way she represented Appalachian people: with generosity and sweetness, yes. But also with defiance and strength. By the time I first met her in 2006, Jean was a true legend. Although I was in total awe of her, it didn’t take me long to feel right at home and we became fast friends. I loved visiting with her and her wonderfully devoted husband, George Pickow, who passed away in 2010. Anytime I would comment on her legendary status, she’d brush it aside, embarrassed. But she was a true inspiration to so many of us. Her accolades are too many to list. In 2002 she was awarded a National Heritage Fellowship from the National Endowment for the Arts, the highest award given in the nation to traditional artists and musicians. Her original compositions have been performed by such artists as Johnny Cash, June Carter Cash, Judy Collins, Emmylou Harris, the Judds, Kathy Mattea, Dolly Parton, Linda Ronstadt, and many others. 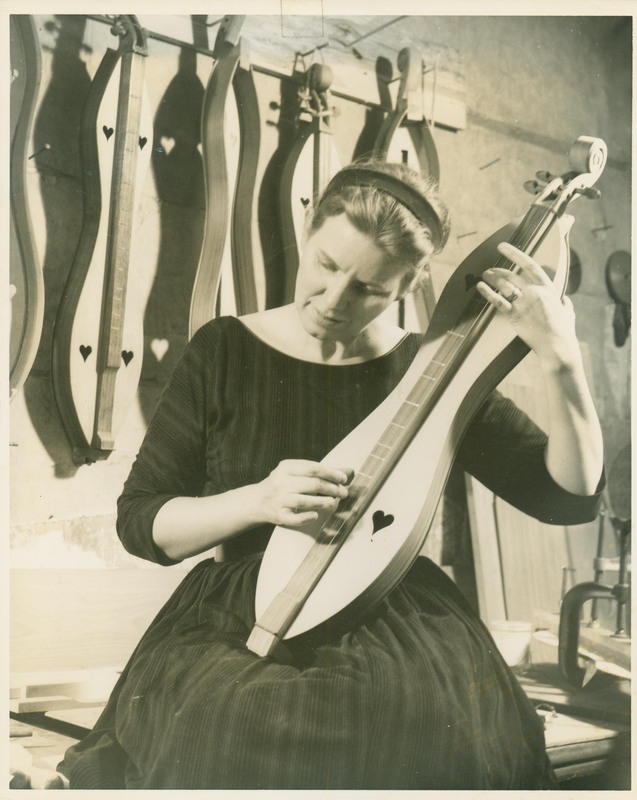 Born in 1922, she went to New York to work in a settlement school and was amazed to find that she eventually became well-known for her singing, playing, and songwriting. By the end of the 1960s Ritchie had recorded twenty albums, served on the board of and appeared at the first Newport Folk Festival (where her iconic performance of “Amazing Grace” is still talked about by anyone who was there), and was considered one of the leaders in the folk music revival. She had also single-handedly popularized the mountain dulcimer. And steadily throughout her career she had become more and more concerned with the environmental injustices facing her homeland. She wrote her first environmental-minded songs under the pseudonym of Than Hall so her parents wouldn’t be harassed and because she felt using a man’s name might make them easier to become published. But eventually she embraced the fight for environmental justice and became a symbol of the movement. In 1974 she recorded what many consider the first of her three true masterpieces (along with None But One and Mountain Born) out of her forty albums. Clear Waters Remembered contains three of the original compositions she is most often recognized for: “West Virginia Mine Disaster,” “Blue Diamond Mines,” and “Black Waters.” It would also be the album that would solidify Ritchie’s position as an environmentalist and activist. “Black Waters” in particular became a rallying cry for an ever-growing outrage against the environmental devastation being caused by strip mining, a form of coal mining that became prominent in the 1960s. The practice was giving many Appalachians pause, especially since most of the coal companies were able to mine the coal with broad form deeds, many of which had been sold decades before. Ritchie became a part of this movement with “Black Waters,” which became its anthem. After struggling with writing “Black Waters” for awhile, Ritchie finished the song after being invited to participate in a memorial concert for Woody Guthrie. She performed it for the first time during that show and introduced it as something Guthrie “might have written had he lived in Eastern Kentucky.” Besides being a powerful environmental song, it also resonated with Appalachians who might not have identified themselves as environmentalists but certainly had a love for the land in their very blood. 1977’s None But One is Ritchie’s most critically-lauded album; it was even awarded the prestigious Critics Award from Rolling Stone magazine. The album contained two more of Ritchie’s most famous songs of social consciousness, “None But One,” a treatise on racial harmony, and “The Cool of the Day,” an ancient-sounding spiritual which demands environmental stewardship and is now widely used as one of the major anthems in the fight against mountaintop removal. It is a song that has already achieved classic status by being included in the hymnal of the Society of Friends. Ritchie allowed Kentuckians For The Commonwealth to use the song on their popular compilation Songs for the Mountaintop, which raised money for the fight against mountaintop removal. In 2007 Ritchie performed the song at The Concert for the Mountains, an event held in New York City with Robert Kennedy, Jr. in conjunction with a delegation of Appalachians who attended the United Nations Conference on Environmental Stability to speak out about the devastation caused by the form of mining. “I never feel that I’m doing very much to help our poor mountains,” Ritchie modestly told me in 2008 after I told her she was one of the reasons I had become an environmentalist. “Beyond making up songs and singing them, I don’t know what else to do. It seems an accolade I don’t deserve.” I wanted to tell her that words and music were the main ways we had always fought back, and that her words and music had done more than she could ever imagine. But then I saw that there were tears on her eyes. Her face was turned to the white light of the window and she was lit as if beatific. I had always thought she was. In that moment, Jean was visibly upset. “Sometimes, when I think of how it’s all gone …” she began, but had to stop speaking. Jean leaves behind a legacy of love and light. Of kindness and dignity and strength. She fought back with words and music, and she taught us to do the same. I can’t imagine a better way to be remembered than that. Jean Ritchie’s “Black Waters” performed by John McCutcheon, Tim O’Brien, Suzy Bogguss, Kathy Mattea, Stuart Duncan and Bryn Davies. Welcome to our special feature where we invite guests to pull up a chair, sit a spell, and share their views on issues important to you.